The photo above was taken from the nature trail on the hill behind the Moraine Park Museum. The museum is built in a historic lodge and at one time the area where this photo was taken had numerous cabins on it. 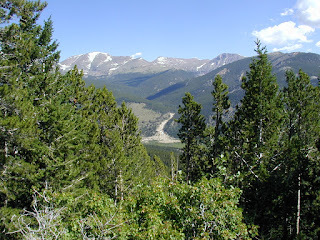 Bear Lakes Road is a side road off of the Trail Ridge Road (Highway 36) west of the town of Estes park. 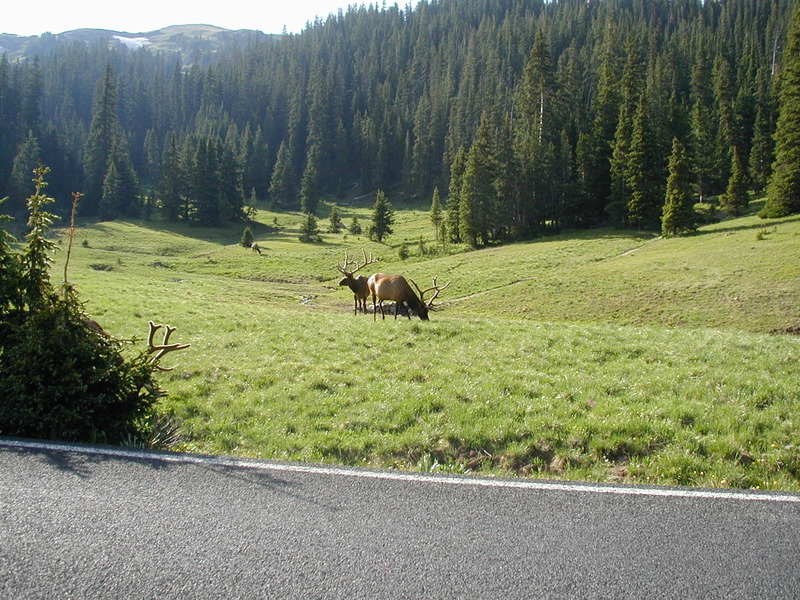 The Bear Lakes Road turns off just past the Beaver Meadows Entrance to the park. The road leads around Moraine Park and then winds it's way up to Bear Lake, the most popular destination in the park. ??? Why are there "Parks" inside the park? 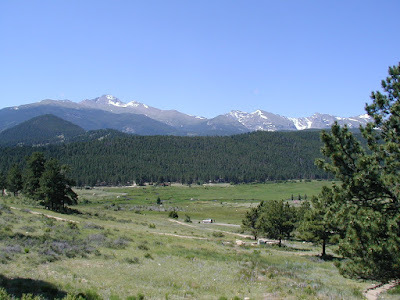 The large meadows in Rocky Mountain National Park all have names that end in "park" rather than meadow. 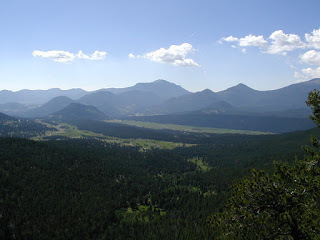 So Moraine Park is not a actual separate park, but rather it is a large meadow. Elsewhere it would likely be called "Moraine Meadow." Many years ago there was a small town located in Moraine Park. The town has been removed and the land restored back to it's original appearance. Duck with ducklings at Bear Lake. 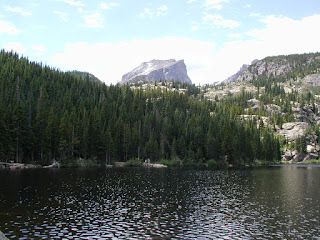 The trail that loops around Bear Lake has to be one of the most popular trails in the USA*. At no time were we more than 10 feet from someone else while hiking this trail. It is a beautiful lake, but with so many people it is a bit like being at an amusement park. 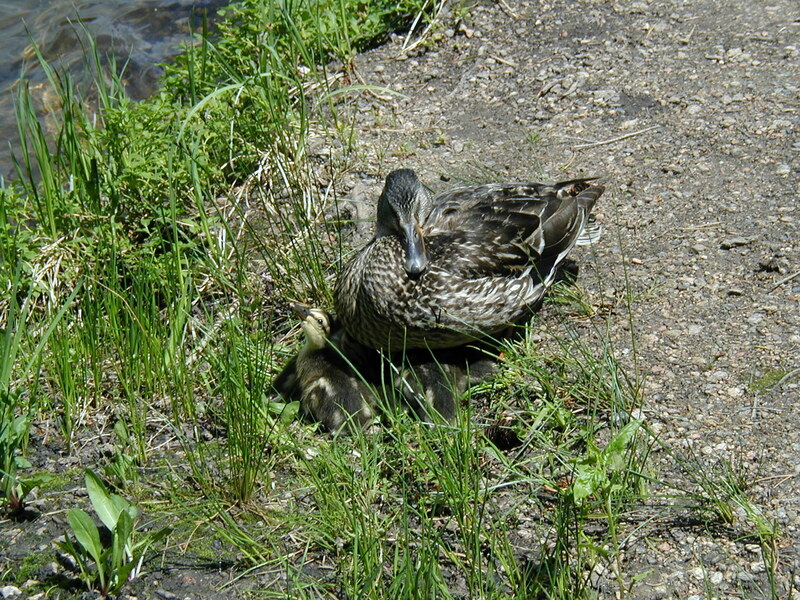 This duck with it's ducklings were sitting in the grass just a couple of feet from the trail clogged with people. The duck obviously knows people are no threat to it! 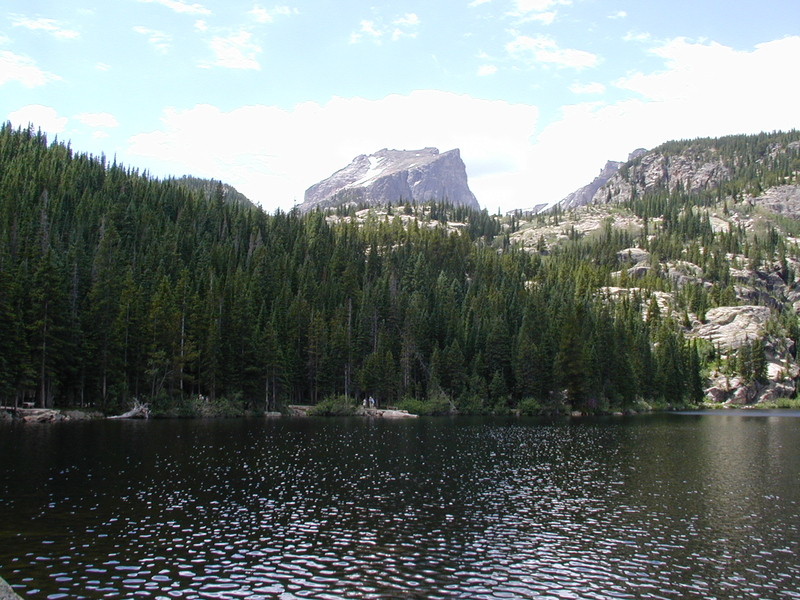 Bear Lake and the peaks around Bear Lake. 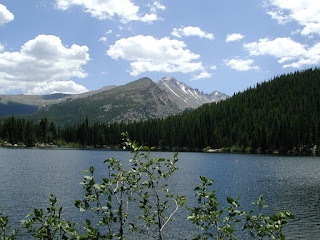 Another photo of Bear Lake and surrounding peaks. Fall River Road starts in Estes Park and leads into the park up the Fall River Canyon and eventually joins the Trail Ridge Road. Lawn Lake Alluvial Fan and the Roaring River. A dam upstream of this point at Lawn Lake failed in 1982, sending a torrent of water down the Roaring River Canyon. The water carried tons and tons of rock downstream with it, leaving this alluvial fan where the canyon ends at the top of Horseshoe Park. From there the water spread out over Horseshoe Park, then flowed down into Cascade Lake. All that water overflowed the dam at Cascade Lake, which also failed, sending a even larger torrent of water down Fall Canyon and through downtown Estes Park. Fortunately there was enough time to evacuate the town before the water arrived. 3 people were killed in the flood, one camper in Roaring River Canyon and two campers in a Horseshoe Park campground. 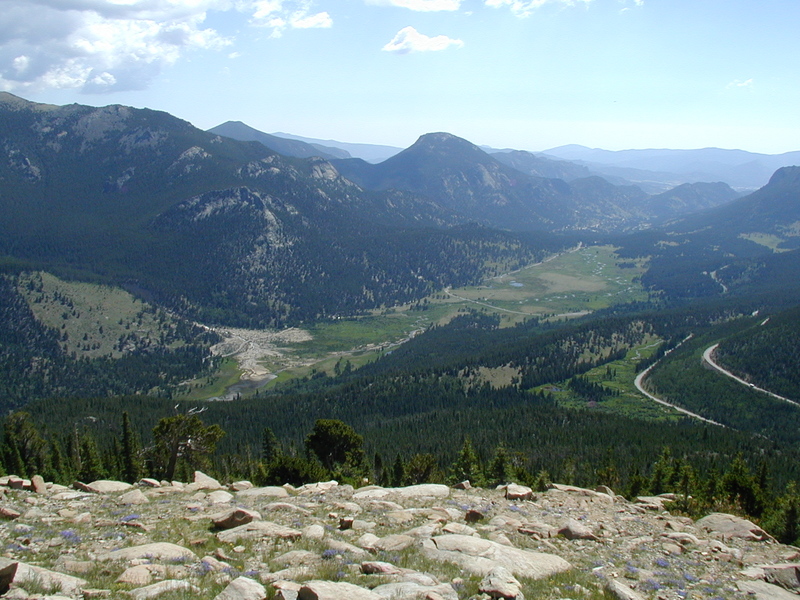 Like the Fall River Road, the Trail Ridge Road leaves the town of Estes Park and enters the park. 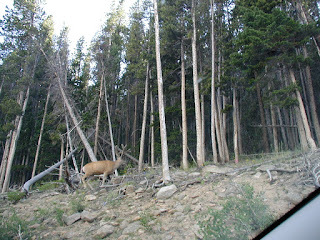 It is the fastest way into the park from the Town of Estes Park. It enters the park just outside town at the Beaver Meadows Entrance Station. 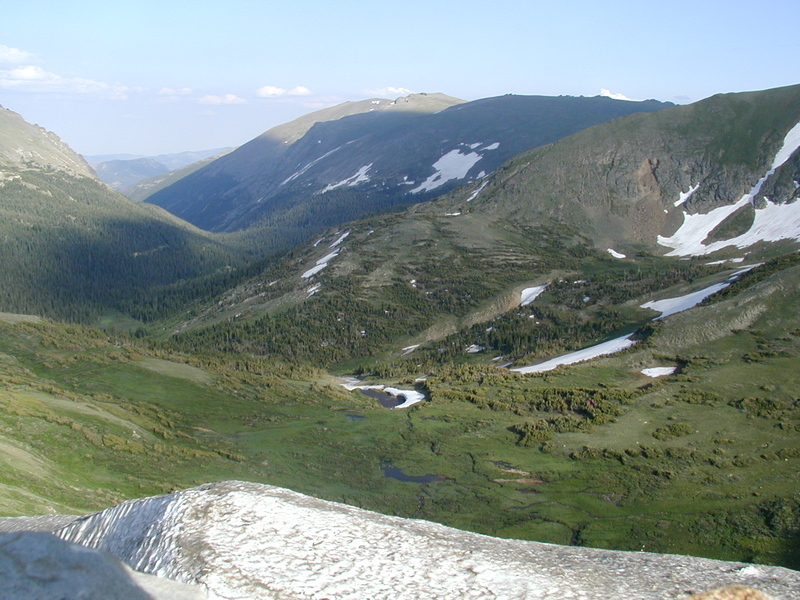 From there it follows the ridge between the Fall River Canyon and Forest Canyons, until it reaches the top of Fall River Pass near the Alpine Visitor Center. This road is closed in winter over the pass due to snow. Roaring River Alluvial Fan, in the distance framed by the trees. You can see the enormous amount of rocks that were deposited at the base of the canyon by the flood. Upper Beaver Park and Moraine Park. This view is from Many Parks Curve on the Trail Ridge Road. The meadow closest to the camera is Beaver Park, the one behind it is Moraine Park. Just a bunch of Elk grazing. The sort of thing tourists from the city like me stop to see. We finally see a wild Moose! 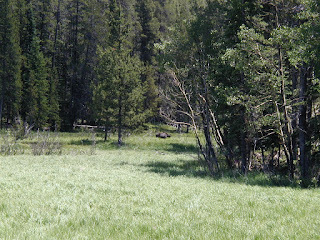 Not very close up, you may have to look closely, but it is a moose at last! We traveled for a week through Alaska a few years ago and never saw a single moose. Hidden Valley is a small valley above Horseshoe Park. 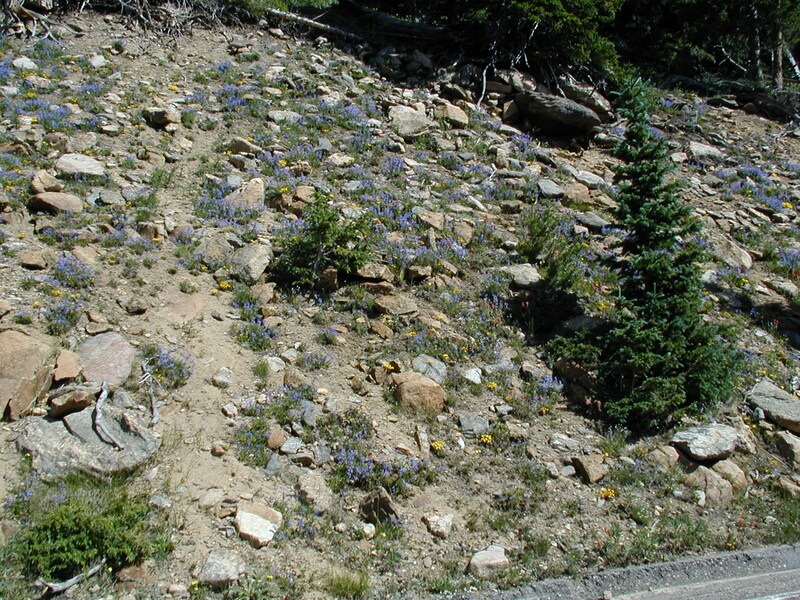 A small downhill ski area once was located in the canyon above the valley. The former Hidden Valley Ski Area (later called "Ski Estes Park") was removed by the park service in 2004-2005. It had two Poma Lifts, two T-bars, and a small day lodge. The base area of the ski area has now been turned into the Hidden Valley Picnic Area with a big parking lot, restrooms, and a small visitor center. 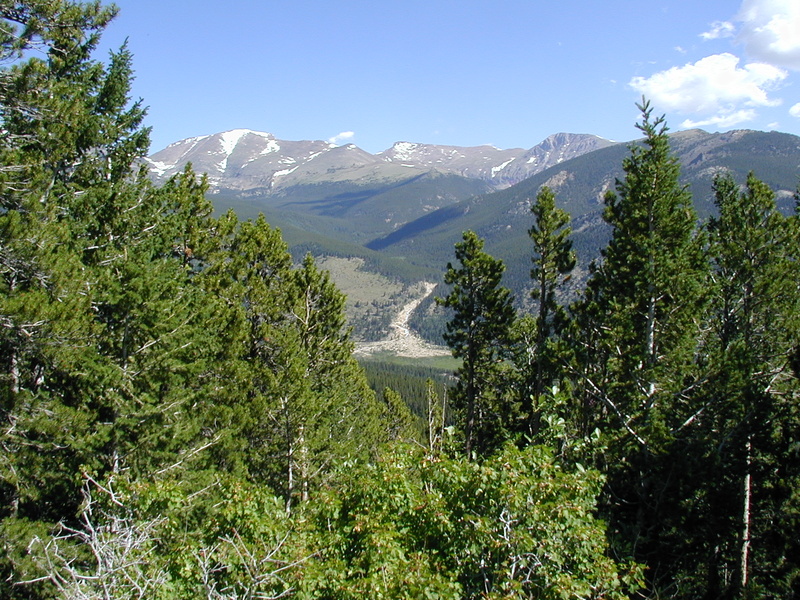 It is located on a spur road just off Trail Ridge Road. 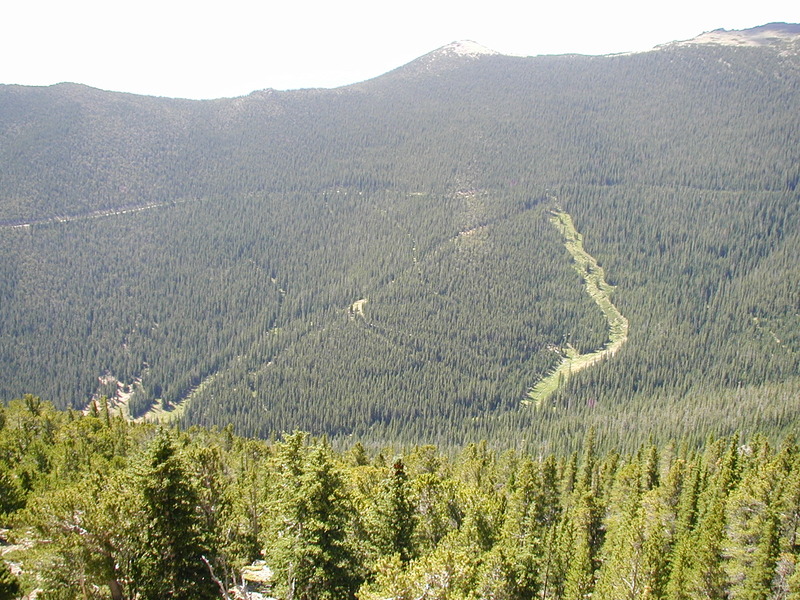 The cleared area in this photo was one of the upper ski runs. 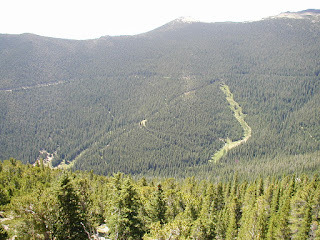 This photo was taken from the Rainbow Curve Overlook on Trail Ridge Road looking down at the old ski runs. Roaring River Alluvial Fan, Sheep Lakes, & Horseshoe Park This is the view from Rainbow Curve Overlook on the Trail Ridge Road. 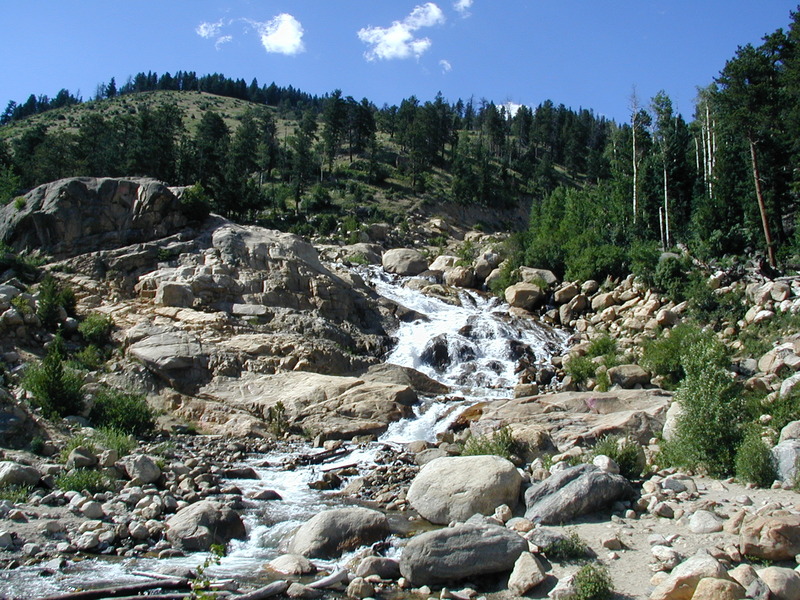 The Roaring River Alluvial fan is on the left. 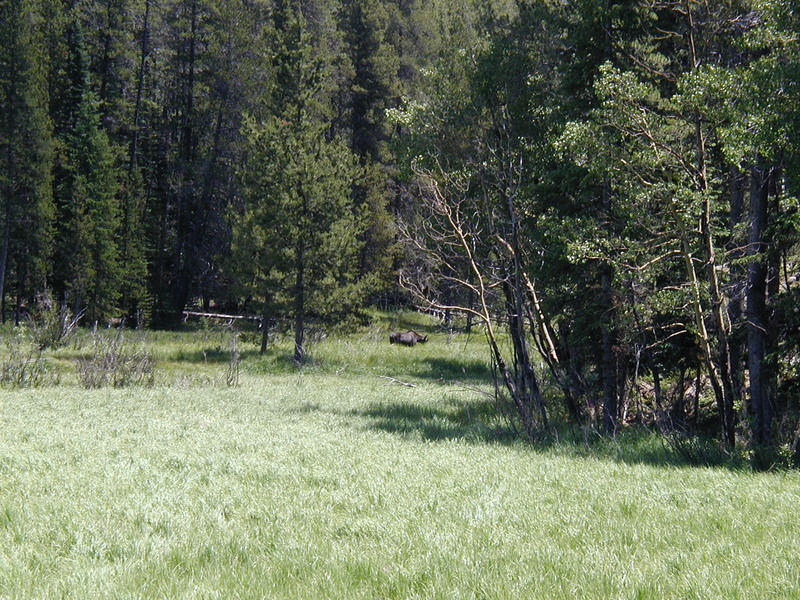 Horseshoe Park is the large meadow, Sheep Lakes are the small ponds on the left side of the meadow. 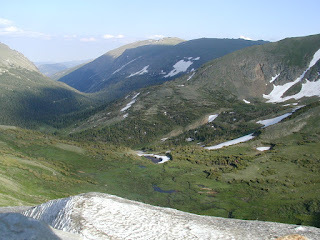 The road on the right is the Trail Ridge Road winding up the canyon side to where the photo was taken. Young Elk Bull with fuzzy antlers. Forest Canyon. On the opposite side of the ridge from Fall River Canyon is Forest Canyon. 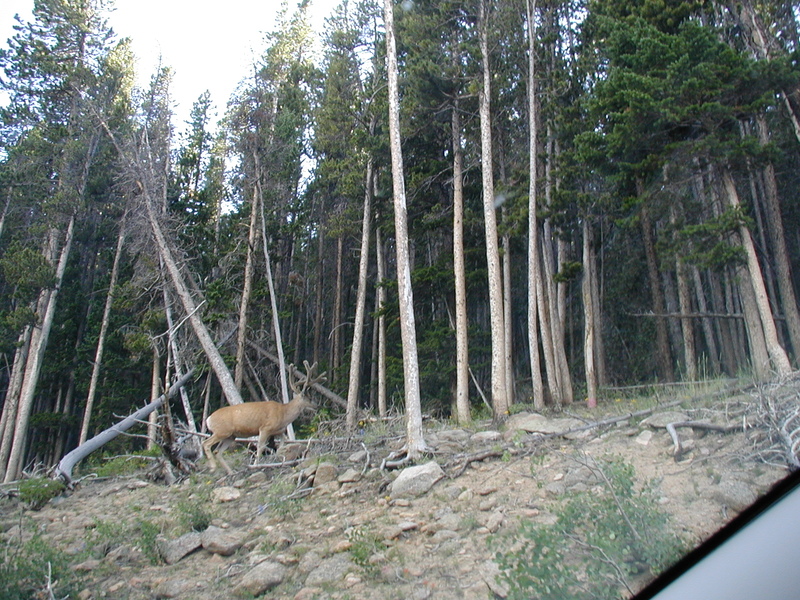 This photo was taken at the Forest Canyon Overlook on Trail Ridge Road. 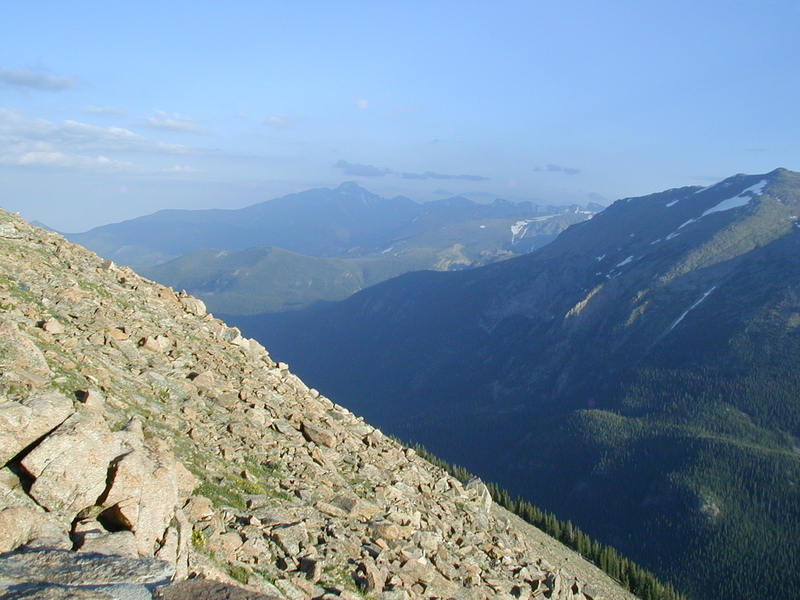 This is the view looking down the Fall River Canyon from the Alpine Visitor Center on Alpine Ridge (11,796 feet elevation). Yes, that white at the bottom of the photo is icy snow on the ground - in mid-July! Roadside Wildflowers Wildflowers along the sides of Trail Ridge Road.